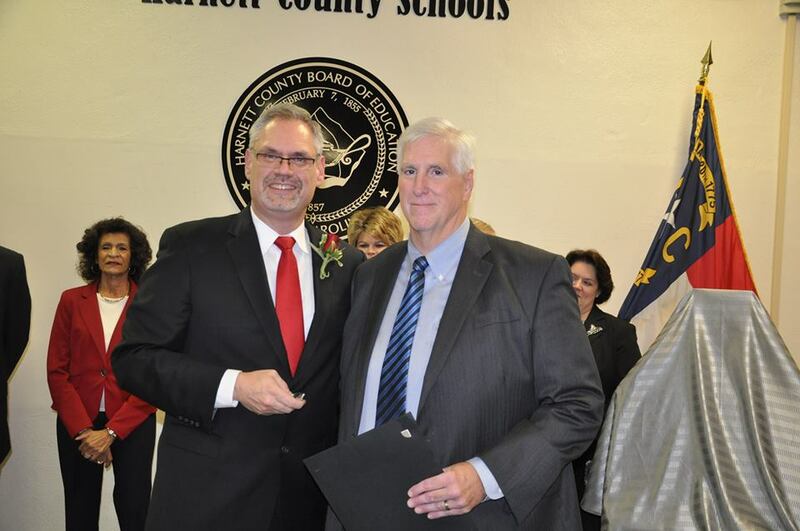 Congratulations to Tom Frye, Harnett County Schools Superintendent, who was honored at a reception November 25 celebrating his 30 years of service to the students of Harnett County and his upcoming retirement at the end of this month. Mr. Frye has worked in the Harnett County School System for 30 years and started his career as a math teacher at Western Harnett High. After many years in the classroom, Mr. Frye came to the central office and was the System Administrator for four years. He then was promoted to Director of Media and Technology, serving in this position for seven years. In 2009 he was named Assistant Superintendent of Auxiliary Services and served in this role for two years before being named Superintendent. Mr. Frye is a graduate of Western Carolina University where he earned a Bachelor of Science Degree in Education/Mathematics with a Minor in the French Language. He received a Master of School Administration Degree in Educational Leadership from North Carolina State University. He also completed the Certified Education Chief Technology Officers Program in 2010 from the University of North Carolina at Chapel Hill. Mr. Frye is a member of the North Carolina Association of School Administrators, the North Carolina Association of Educators and Phi Kappa Phi Honor Society. He also serves as a member of North Carolina State Employees’ Credit Union Advisory Board. Tom is originally from Sanford, NC and currently resides in the Anderson Creek area.